Genero Zeefuik will return to Groningen tomorrow ready to plead for a return to Hearts. The Dutchman revealed he hasn’t given up hope of playing in Edinburgh next season and intends to hold talks with Groningen about his future. The striker’s late double earned Hearts a 2-2 draw with Rangers on Saturday on the final day of the Scottish Championship campaign. That sees Zeefuik end his four-month loan spell with 12 goals from 15 appearances. He admitted he is eager to rejoin Hearts in the Scottish Premiership next year if possible. The Dutch club want a transfer fee for the 25-year-old, whose contract does not expire until next year. Hearts will not pay money for him, nor do they want to match the salary he is on in the Netherlands. Zeefuik must therefore bargain with the Groningen board to have any chance of returning to Scotland. “I go back to Groningen tomorrow and I will train there. Once the season finishes there we are going to talk,” he told the Evening News. “Maybe I can come here to Hearts or go to another club. I don’t know. We will see at the end of the season. Of course there is a small chance I can stay. I don’t think Groningen want me. Robbie Neilson, the Hearts head coach, admitted it still looks unlikely that Zeefuik will be back at Tynecastle for pre-season training. “It’s a good way for Genero to go out,” he said of the striker’s two goals at the weekend. “He’s done exactly what we wanted when he came here in January. “We needed a guy to lead the line and he’s done exactly that. That’s 12 goals in four months and it shows what a quality player he is. “I’d like to keep hold of him but I don’t think I will because he’s still got a year left at Groningen and he’s on good wages. One player definitely moving on is captain Danny Wilson. He lifted the Championship trophy on Saturday in what was his final Hearts appearance after he invoked a contract clause to leave for free. Celtic and Panathinaikos are both interested in Wilson. The Greek club’s technical director, Leonidas Vokolos, watched the 23-year-old against Rangers from a seat in the Wheatfield Stand. He has now returned to Greece to compile a report for the Panathinaikos board. 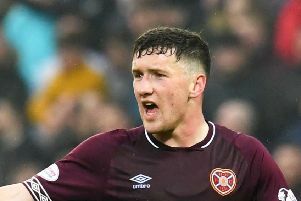 Wilson explained that he is leaving Hearts under the right circumstances. “It was a big decision but it’s not one I regret just because of the celebrations here,” he said. “I’ll always have fond memories of playing here, just as I have memories which aren’t great. “The celebrations make it all worthwhile, but it was a decision I took for the betterment of my career and it’s something I stand by. “I didn’t want to give the future too much thought while we were chasing down a title because I wanted my full focus on that. But, once it was won I spoke to my family and my girlfriend, so Hearts will move on without me. “This team will be fine. They’ve got a good manager and good people around the club as well as good players.